After a quick tease of Han (Alden Ehrenreich) flicking switches on the dashboard of his future ship, the trailer opens with the young Corellian blazing a trail in a junky-looking speeder. “I’ve been running scams on the street since I was 10,” he tells us, as we find that Han isn’t alone in his ride. He’s joined by Qi’ra (Emilia Clarke), who has presumably known Han ever since those scamming days. Edit: As Alexander Love pointed out on Twitter, you can glimpse Han’s dice—the gold pair he eventually hangs in the Falcon’s cockpit—from A New Hope and The Last Jedi hanging from the top of the front window! “I was kicked out of the flight academy for having a mind of my own,” Han continues, as it turns out he and Qi’ra are in the middle of a chase. The new Stormtrooper—a new design that’s been referred to in leaked merchandise for the film as a “Range Trooper”—we see on a chunky speeder bike is actually one we saw in set pictures from just before former Solo directors Phil Lord and Chris Miller left the film. Han’s line about being “kicked out of the flight academy” offers something very intriguing for old Expanded Universe fans. In the old Expanded Universe, Han did indeed sign up to join the Imperial Academy as a teenager, desperate at a chance to fly ships for a living. He was kicked out for a little more than “having a mind of his own,” though—he was drummed out for attacking a senior officer to help Chewbacca, then an Imperial slave, escape captivity. That could still be the case in Solo, which will apparently show us how Han met his wookiee friend in the first place. It certainly wouldn’t be the first bit of EU lore to make its way back into Disney’s Star Wars canon. After ditching the Stormtrooper, we get a quick shot of a few more speeders chasing Han. These too have been seen in previous merchandise leaks, and are apparently piloted by an alien called Moloch and a human named Rebolt. All this, presumably, is taking place on Corellia itself, given that we know it’ll be in the movie and it is, after all, Han’s homeworld. “I’m gonna be a pilot. The best in the galaxy,” Han adds, as we get to see the young man examining a snowy landscape. It’s possible this is also another part of Corellia, but it could just as likely be a new planet altogether—we see a bit more of this world in the Super Bowl TV spot, including a fight atop an Imperial freight train that sees Beckett (Woody Harrelson) battle an alien warrior we meet later in this trailer. At last, we finally get a glimpse of the Millennium Falcon—which, in Solo, isn’t exactly the “hunk of junk” it was by the time of A New Hope. On the inside, it practically looks brand new. We get a better look at the outside later on, but this foggy shot of Han admiring his future ride is still pretty nice, too. Another world, and some more new characters to meet. First we see Qi’ra and Han making their way across a sandy cliff face to a swanky looking tower, and then we see Han in a similar environment with our first glimpse at Tobias Beckett, who informs Han that he’s looking to build a crew. Harrelson has described Beckett as a criminal and Han’s “mentor” in the film. Looking rather more glamorous than she did earlier, Qi’ra emerges from the Falcon in an elaborate get-up. 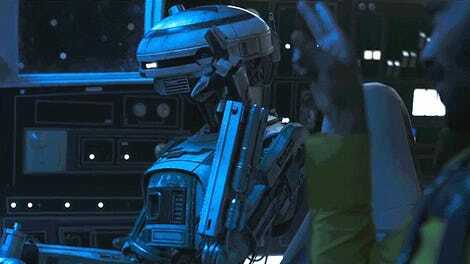 She’s joined by a cool-looking droid that is possibly Phoebe Waller-Bridge’s character. We do know the actor is playing a major motion-capture role described as being in the vein of Alan Tudyk’s performance as K-2SO in Rogue One, so a droid would make sense. Three more members of Beckett’s crew fly past in quick succession. First is another young version of a familiar face: Lando Calrissian (Donald Glover), future Baron Administrator of Cloud City and, in Solo’s time, the current owner of the Millennium Falcon. Next we get out first look at Thandie Newton’s mysterious character, who we know barely anything about. A previous set picture from Ron Howard himself showed her wearing a costume with the Imperial Insignia on it, potentially hinting at a villainous role for the actress, but recent toy leaks suggest at some point the movie will see Han and Beckett’s crew disguise themselves as Imperials and infiltrate the planet Mimban (famous in the old Expanded Universe as being the setting for the first-ever Star Wars tie-in novel, Splinter of the Mind’s Eye). We potentially saw some of the set-up for that in the Super Bowl spot, with Han looking to sign up for the Academy (again) with a gung-ho recruitment officer. Lastly, we get a brief shot of a multi-armed alien taking the controls of something—maybe the train from the Super Bowl spot? As with Newton’s character, we know nothing about this mysterious member of Beckett’s team. Beckett asks Han if he’s “in,” so it looks like that dialogue about building a crew is from this snowy planet, rather than the world we saw the line used with earlier. Beckett gets an affirmative in the form of a growl from Chewbacca (formerly played by Peter Mayhew in the mainline Star Wars movies, but now played full-time by Joonas Suotamo), who unsurprisingly, still looks like the Chewie we all know and love. We then get a few intriguing shots cut together: Han prepares for a standoff with a group of masked aliens—including the warrior that we saw Beckett fighting on top of the train in the Super Bowl spot—an unknown cloaked figure fighting in close quarters, and the Falcon droid from earlier, surrounded by sparking monitors. Han, piloting a cargo ship on the snow planet, carries what looks like a segment of the freight train from the TV spot (it’s kind of bizarre that those shots aren’t in this trailer, honestly). It looks like some bikes, driven by what looks like those aliens from the sand world, are trying to pull Han’s haul away from him, only for the smuggler to let them have it in a rather explosive manner. We then come back to Han and Qi’ra, who tells Han, “I might be the only person who knows what you really are.” Given that it seems like she’s known him since his early days on Corellia, it looks like young Solo has some secrets he’s keeping from everyone else. Whatever it is, we know it’s not his “real name,” at least. The last scene in the trailer is one of the most intriguing altogether: The Falcon, pursued by a Star Destroyer (and a new variant of TIE fighter that has an extra turret module) through a stormy corridor, with Han and Chewie at the controls while Lando and Qi’ra watch. Not only do we get a look at the exterior of this new-old Millennium Falcon (which has not just a blue-and-white paint job, but a bulkier “nose” area, which means the ship will likely go through some scrapes and modifications before it looks like the vessel we’re all familiar with), but we might be getting our first glimpses of Star Wars history. Ron Howard has long been teasing that Solo will include the planet Kessel, a spice-mining world in Star Wars made infamous by the “Kessel Run” Han touts in A New Hope as something he completed in the Falcon in 12 parsecs, sparking off years of debate about what he actually meant (and why he uses parsecs, a measurement of distance, rather than time, when bragging about it). Plus, a leaked version Lego set for the movie describes this version of the Falcon as the “Kessel Run Millennium Falcon.” Could this sequence be our first glimpse of the historic run being made? Whatever it is, it’s going to be a dangerous trip for the crew—not only do they have Imperials to deal with, but a giant, tendril-waving alien creature inhabiting this stormy corridor, too. Anticipation for a glimpse at Solo, especially in the wake of its director turnover, has been sky high. With the movie just months away, this first look leaves us with almost as many questions as we had before we’d seen little more than the cast and the movie’s ex-directors hanging out in the Falcon cockpit. Just who is Qi’ra to Han? How do the things we saw in last night’s TV spot fit in to what we saw in this trailer? What is the actual story of the movie beyond what looks like a few elaborate space heists? We’ll presumably be learning a lot, lot more in the next three months, since Solo: A Star Wars Story hits theaters May 25.